My students had a fun time planting these bio-degradable bookmarks. Unique product that went over very well. Gave these bookmarks to all of our students to start the year on the right foot. Nice product for a very affordable price. Thank you Custom Earth Promos. Love the design of this bookmark. Gave them to all my students to begin the year with. It's fantastic that the bookmarks are eco-friendly. Such a nice way to combine earth-friendly items into our school and class room. Gave these to all our students to congratulate them on a great year! Really cool idea for a bookmark. Second time ordering these, they were a huge hit as a giveaway at our marketing convention. So happy with my final product ! Love the earth friendly aspect as well as the cheerful design, my students loved them! Really refreshing to work with this company. They answered all my questions immediately and I really can appreciate the attentiveness. Pretty neat that soy ink is used when making this product. Wild flowers are my favorite. My students will use these bookmarks throughout the year and then we will plant them in our school garden. Ordered 10,000 of the seed paper bookmarks with my brand on them. I handed them out at the street fairs and people really that it was a neat idea. Just received our seed paper flower bookmarks, they look great and have a great premise behind them. 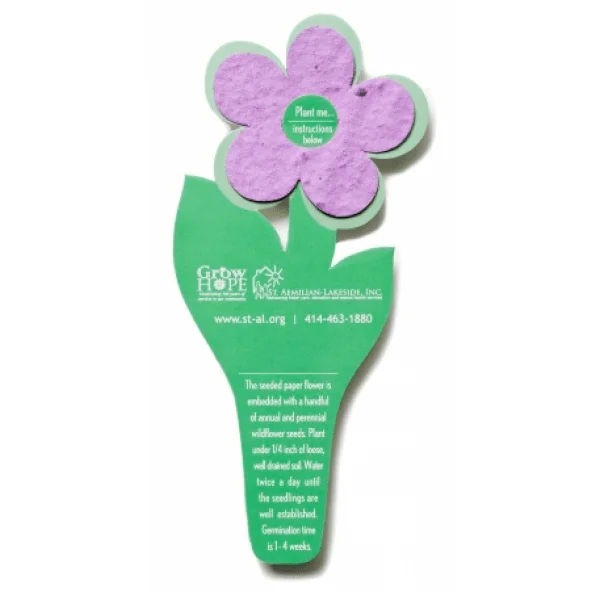 Creatively designed to showcase a colorful, ready-to-plant 2.75" wide flower seed paper insert, Custom Earth Promos' Seed Paper Flower Bookmarks are an increasingly popular crowd favorite. The seed paper uniquely integrates with the recycled cardstock without the use of any adhesives or chemicals. The 100% recycled cardstock silhouette holds the 5 petal flower-shaped seed paper securely in a circular die-cut, strategically placed in the center of the flowers' five petals. This creates a modest, yet highly visible area to include an inspiring or instructional message like "plant me!" or "grow time" in the center of the seed paper flower. Made from entirely recycled, recyclable and biodegradable materials, seed paper bookmarks are an exceptional choice to promote your eco-friendly brand. Today's consumers place more value on the social and environmental values of brands than ever before. To remain successful and gain market share in their industry, brands must establish and effectively communicate their active investment in sustainable products and production methods. Environmental responsibility is now surpassing traditional influences among modern day consumers. Brands who fail to take action and reinforce their societal commitment to waste reduction and sustainability are destined to fall behind their proactive, eco-responsible competitors. 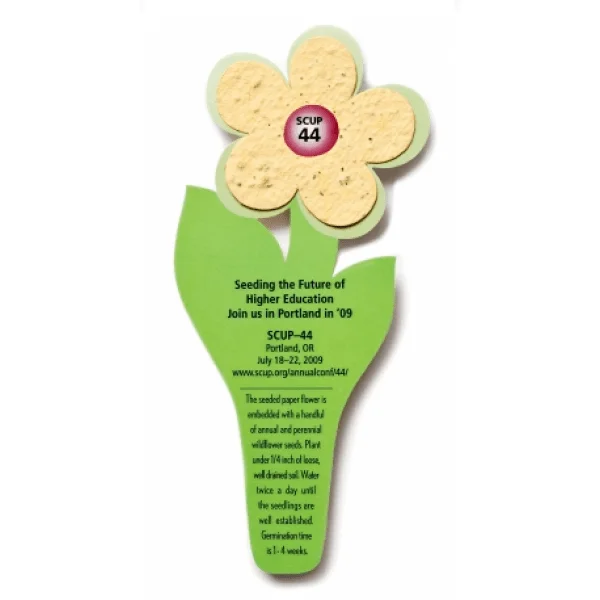 Invest in the eco-responsibility of your brand image through an affordable and effective medium such as our ready-to-plant Seed Flower Bookmarks. Stay one step ahead of your competition, retain current customers and attract prospects by taking action to secure a sustainable future! This modestly sized advertising tool has the profound potential to increase the reach of your campaign and establish an eco-ethical brand. At Custom Earth Promos, we give customers complete freedom to build their Seed Paper Flower Bookmarks order from scratch, guaranteeing a final blueprint that genuinely reflects your brand and captures your message with every detail. Include an eco-friendly slogan or fun environmental fact along with your company logo. Earn the appreciation and admiration of your customers by proudly presenting your logo alongside a statement of eco-investment. Work directly with our in-house design experts to create the custom graphic that will be imprinted on the 100% recycled cardstock flower silhouette. Matte or glossy finishes are available, depending on the tone of your message and brand aesthetics. Next, choose a seed paper color that best complements your imprinted graphic to use for the ready-to-plant 2.75" seed paper flower. Your colorful flower will sit securely in the circular die-cut slit, creating a unique and eye-catching effect. Receivers of your savvy seed paper bookmarks will now associate your brand with environmental responsibility, fostering brand trust and loyalty for years to come. When planted under a thin layer of soil and provided adequate care, the flower shaped seed paper will grow into a colorful garden of wildflowers. This garden will serve as a bold and beautiful reminder of your brand, effectively promoting your message without the use of any potentially invasive tactics to the environment or your customers. 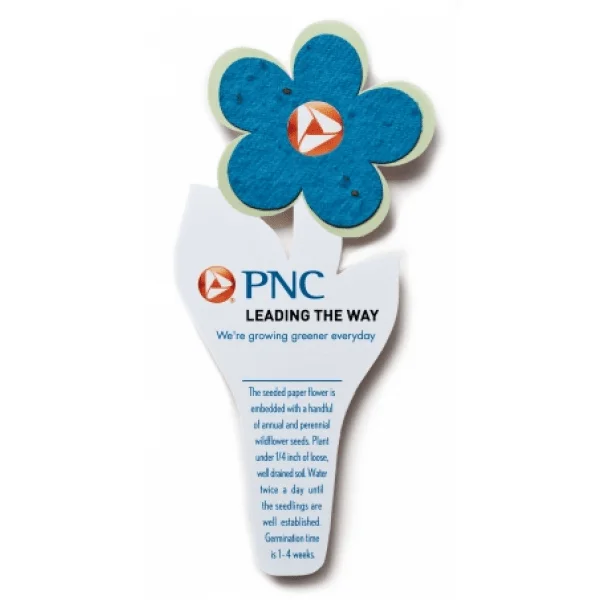 After planting their seed paper flowers that will soon bloom into a blossoming daily reminder of your brand, customers can use the flower silhouette cardstock bookmark. Double your exposure and supercharge your campaign with this 2-in-1 advertising tool from Custom Earth Promos, the epitome of flower power! A stunning representation of Custom Earth Promos' all-natural philosophy, Seed Paper Flower Bookmarks eliminate eco-impact and are made only with earth-friendly materials including 100% post-consumer recycled content and soy-based pigments for printing. We use only the highest quality seed paper in the industry to guarantee your flowers will grow, ensuring seeds have the highest germination rates, are USDA-approved and GMO-free. Our seed paper products are manufactured in the USA at our 30 kW solar-powered facility, posing no harm to the environment at any stage of production, during use or following disposal. Leave customers with a living, lasting impression of your brand with 100% recycled, recyclable and planet friendly flower seed paper bookmarks. Seed Paper Flower Bookmarks are infused with our most popular blend of perennial and annual wildflowers. However, like all aspects of your design blueprint, the seed mixture can be customized to complement your campaign or fuel a seasonal announcement. For bulk seed paper bookmark orders, you can specify the seed species that we infuse into the handmade paper pulp that will be pressed to create your seed paper flowers. This paper pulp is made with white, undyed 100% post-consumer recycled material and is guaranteed to be free of any potentially hazardous dyes or additives. Our talented factory is always developing new and seasonal seed mixes, like the 'Hope Mix' for breast cancer awareness which includes pink perennials and annuals or the 'Evergreen Mix', a popular choice for holiday promotions. Be sure to ask your design expert what special paper types we currently have in stock!